Refactoring is the process of changing the structure of the existing program without changing its functionality and usage. Refactoring also used to improve the code reusability, increase performance and also remove the duplicate functionality or unused functionality. Refactoring is a task that should be performed very carefully because a single mistake could generate a lots of bugs. In the refactor menu, we can find all possible refactor option. There is also a shortcut option available for the refactoring. "Ctrl+Alt+Shift+T" shortcut will open a pop-up which shows all the refactoring options available for the piece of code where the cursor is hovering over. 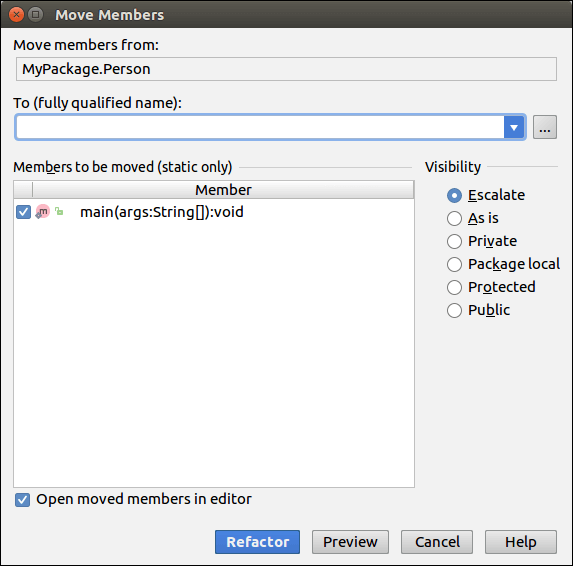 This action provides facilities to rename methods, attributes, parameters and so on. Here, we will create an example with class name Person. In the menu bar, go to Refactor -> Rename. Following screen appears. Change the name and click on Refactor Button. Go to Refactor -> Copy. Below screen appears. Enter the New name, Select Destination package and click Ok button. Go to Refactor -> Move. Below screen appears. Provides the destination. Click Refactor. 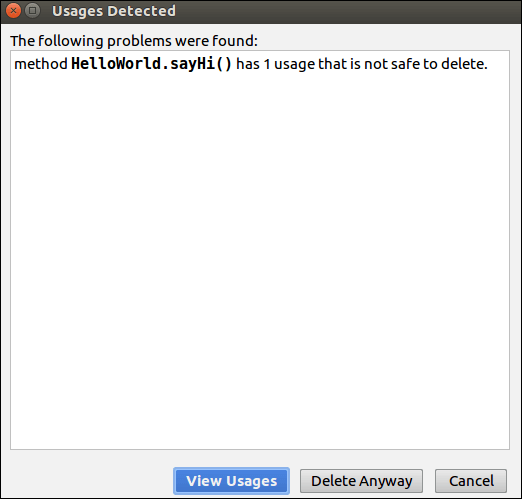 Type the below code in the editor and select "sayHi"
If the sayHi method is used anywhere than it will show on the below screen. Type the below code, position the cursor whose duplicates we want to search.